Recently I upgraded to JAVA 1.7.007, and since then I haven't been able to use the drag-drop method to copy files from an Outlook email into TB. When I drag a file, what I get in TB is a link to the email. I also attempted to copy files into TB by right-clicking on the file within Outlook and then using Paste File within TB. However this results in an error message stating "The file '' could not be copied." The  on my screen is actually a box. I am still able to drag files from outlook into the Plex or the thought folder. My Java version updated to the day is 7.0 .70 .10. I have just test this and it is working fine using the latest version of Java, Outlook 2010, and latest version of TheBrain. I'm still on XP (so everything is 32bit), and I didn't reinstall either Outlook 2007 or TB 7.0.4.5 before this problem began. I went ahead and removed the redemption file from Outlook, stopped Outlook, reinstalled TB, started Outlook (confirmed the redemption file was there), and then tested drag-drop. The results were the same -- instead of getting a copy of the file in TB, I get a copy of the email. This morning I uninstalled/installed Java 7...problem still existed. Then I uninstalled Java 7 and installed Java 6...problem circumvented. This seems to point to an incompatibility between TB7 (on XP) and Java 7. 3. You will now see all active, non-active, and disabled add-ins. Click on the add-in you want to enable/disable and then click on the Go button towards the bottom. Patrick, I did do that as well, but since I described a process in which the Redemption add-on was removed and then re-added, I didn't bother stating that I also manually removed and re-added it. Has drag-and-drop been tested in-house on a workstation that also has XP, Outlook 2007, TB7 and Java 7? Have you manually added the plug-in after re-installing TheBrain7? Un-installing/re-installing does not guarantee that the plugin was added successfully. Patrick, my previous reply to you, in which I said "I did do that as well" was confirmation that I did what you'd asked. So, yes, I've manually removed and added the plugin...many times and in every conceivable combination. I'll send a copy of the output.log via email. Patrick, how do you tell whether you have 32 or 64 bit Brain installed? I'm not sure I'd realized there were alternative versions. 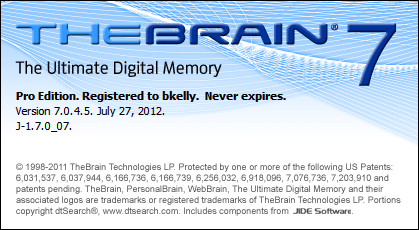 TheBrain will say 64-bit on the splash screen if you are using 64-bit. It will not display any bit information, otherwise. Well 64 vs 32 isn't an issue then. But I did just go and add the redemption.dll add-in from the brain directory, re-started Outlook and the Brain, and it worked! I now do seem able to drag emails again into the Brain! I upgraded to java 7 again and, just like before, I'm unable to drag a file from Outlook into TB. (Same symptoms as before.) The reason I tried this again is that my workstation's OS is now Win7. Before upgrading to java 7 I was using java 6 on Win7 and drag-drop worked. 2. I manually removed the redemption dll from Outlook and readded it. 3. No I have not uninstalled/reinstalled TB. Obviously TB has an issue with java 7, whether it be on XP (my previous OS) or Win7 (my current OS). So I need to either upgrade to a version of TB that does work (on my machine...), or configure TB to use java 6 instead of 7. (I still have java 6 installed too.) Since there haven't been any updates/patches to TB since 7.0.4.5 (my current version) I assume that there's no fix for this. If there is, great, let me know. But if there isn't, can I configure TB to use java 6 while leaving java 7 installed? I purchased a new computer that had Windows 8 (64bit) but I am using outlook 2007, which I was hoping would still be compatible with TheBrain 7. I used to be able to drag and drop contacts and email, but although I see the files being dragged, when I drop them nothing is there. Could it be the version of Windows that is causing this? 3. Click on the Go button towards the bottom.